Cisco 8841 IP Phone | 8x8, Inc. The Cisco 8841 is an IP desk phone is the perfect for knowledge workers and remote workers across businesses of all sizes. The 8841 makes collaboration easy with its comprehensive feature set backed by a high resolution five-inch color display. Call quality on the Cisco 8841 is incredibly clear with its high-quality, full duplex wideband audio and superior echo cancellation. 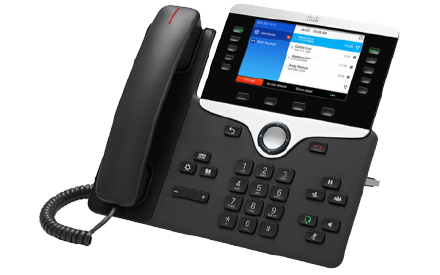 The cost-effective Cisco 8841 allows users to navigate the phone efficiently with its five-way navigation cluster while also having easy access to 8x8’s rich set of VoIP features.